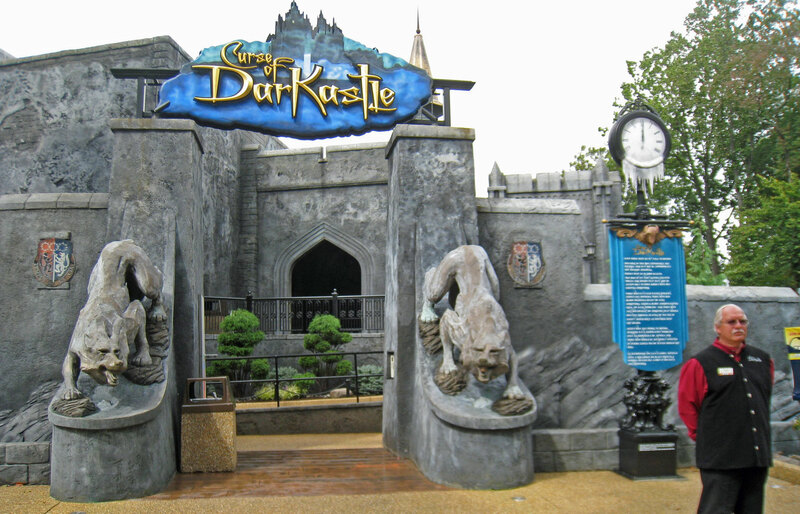 January 23, 2018 – Busch Gardens Williamsburg announced the permanent closure of Curse of DarKastle, a 3D dark ride that was introduced in 2005. As a new haunted house was utilizing its ride building for the park’s Howl-O-Scream Halloween event, Curse of DarKastle was closed in September 2017, and for the remainder of the park’s operating season. It was initially assumed that Curse of DarKastle would return in 2018, but today the park announced its permanent removal. The attraction will be removed, but its building will see continued use as an event venue, like the aforementioned haunted house set up for Halloween, or private events. No reason was given for the removal, but the management might have considered the aging 3D ride redundant with the addition of Battle for Eire, a new Virtual Reality ride opening in the park’s Ireland-themed Killarney section for the 2018 season. Battle for Eire will replace the simulator attraction Europe in the Air, which was closed after the 2016 season. Europe in the Air was a motion theater attraction, which had previously been Corkscrew Hill until 2010. Battle For Eire will re-use the theater’s moving platform, but replace the giant projector screen with Virtual Reality headsets. The theme of the attraction is a nod to Corkscrew Hill, which also featured an Irish theme. Curse of DarKastle was a state-of-the-art dark ride when it opened in 2005, with cars that could pivot around all three axes while moving along a track. It was designed by Falcon’s Treehouse and built by Oceaneering Entertainment Systems, both of Orlando, Florida. These companies have also been involved, either separately or jointly, in similar attractions for Universal Studios, Motiongate, and IMG Worlds of Adventure theme parks around the world. Dark rides like these have gone through a tremendous technological development in recent years, with more still expected to come with the maturing of Virtual Reality technology. Read about the closure of Curse of DarKastle and speculate on what will replace it in our Forum Discussion. This entry was posted in News and tagged Battle For Eire, Busch Gardens, closure, Curse of DarKastle, Williamsburg. Bookmark the permalink.